You want to develop, engage and retain your staff, right? Of course you do. So, here are the questions you need to be asking. Questions aren’t just for the interview room – in fact, far from it. Asking your employees continual questions throughout their time in employment with you can help you to get the best out of them – and can help them to get the best out of you, as a manager or boss. Asking a few questions, particularly at times of formal reviews or appraisals, can help to get the conversation going, and spark debate. Showing an interest in your employees’ personal development will be noticed – and appreciated, we’re sure. The more questions you ask, the more engaged your employees will be, the happier they will be, and the higher your retention rate will be. So, don’t wait until your employees want to leave before you ask them how they’re feeling and what you can do to make work a better place. Get asking questions now. Have conversations more frequently and more openly – it’ll help with staff retention and employee satisfaction in the long run. 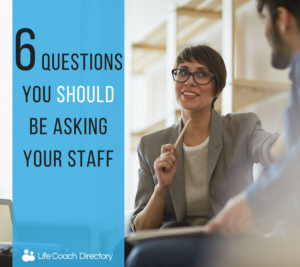 To get the conversation started, here’s six question to start asking your staff right now. 1. What has been your greatest achievement recently / When have you felt most proud of your work? Although most people feel uncomfortable about bragging, almost everyone is happy to share their achievements or talk about their successes (when asked). So, this is a great way to open up a discussion, to show that you’re interested, and want to hear about what’s going well. 2. What situations have caused you stress recently? Stress is inevitable at work. But, that doesn’t mean we can tune out what is causing stress. This question may highlight issues that you aren’t aware of; perhaps more support is needed, or more time allowed to complete tasks. 3. What are your biggest challenges currently / What’s holding you back from accomplishing tasks? Show that you want to find what’s stopping progress – and do everything in your power to eliminate those roadblocks. When you understand the cause of your employees’ headaches, sometimes you can help to reduce them; a big challenge could actually be something that’s easily fixed. At the very least, asking will show that you care and are sympathetic. i.e. What tasks make them happiest, and what do they enjoy most? Assigning projects and tasks based on the interests of your team members often produces the best results. 5. What do you want to achieve in the next six months? Understanding employees’ career goals can help you in creating a motivational workplace. Often, people are most energised and driven by work that may contribute to their future success. So, find out what they hope to achieve – then help them achieve it. 6. What skills or talents would you like to develop? Encouraging employees to increase their knowledge and improve their skills has the potential to make your business more successful. To keep up with the pace of change, everyone must keep learning – so, be sure to encourage ongoing development. To find a business coach to help you with staff motivation and retention, use our advanced search tool.